BN1 2LN British Airways i360 is a 162-metre observation tower on the seafront of Brighton, East Sussex, England at the landward end of the former West Pier. The tower opened on 4 August 2016. Visitors can enjoy the day and night views of the sea, and it is high enough to overlook many sailboats and views of the sea. BN2 1TW The Brighton Palace Pier, commonly known as Brighton Pier or the Palace Pier is a Grade II* listed pleasure pier in Brighton, England, located in the city centre opposite the Old Steine. The amusement facilities include roller coaster, game machine and carousel. Although the amusement park is not very big, the main amusement facilities are very complete. 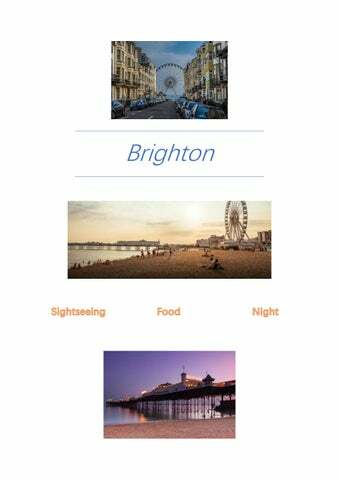 BN2 1ET Brighton beach includes i360 and Brighton pier, and the beginning of June is the best time to enjoy Brighton beach. The clean pebble beach and clear water always attract many visitors. North Road The Lanes are a collection of narrow lanes in Brighton, in the city of Brighton and Hove famous for their small shops and narrow alleyways. The Lanes are commonly taken to be bounded by North Street to the north, Ship Street to the west and Prince Albert Street and the north side of Bartholomew Square to the south. The building at 163 North Street in Brighton, part of the English coastal city of Brighton and Hove, was erected in 1904 for an insurance company and has since been used as a branch by several banks and building societies. It now houses a bookmaker's shop. Road, near the Clock Tower. It was originally built during the 1960s by the architects Russell Diplock & Associates, obscuring several streets. BN1 2HH At regency, you can enjoy fresh seafood and many desserts. It is located next to the i360 and you can enjoy the sea view while eating. BN1 2HG This is a very authentic Thai restaurant in Brighton, where dong Yin gong soup and Thai Fried rice have won numerous praises, just near China garden. start a restaurant serving pháť&#x; while sat on high stools, slurping pho bo, in Ho Chi Minh City. 13 years later, Pho is still a family-run business serving great value, healthy Vietnamese street food that is cooked fresh daily (no central kitchens!). BN1 2RE PRYZM has the pretty good geographical location in Brighton because nearby the seafronts and town centre: Churchill Square. BN1 1NB SHOOSHH nearby the Brighton Palace Pier. Comparison of PRYZM, there is the inexpensive and wide car park. BN1 1EG The location is nearby the Royal Pavilion. BN2 1RH A old building since 19th century. BN1 1PP A huge casino with a number of machines and tables. Offering food, alcohol and the car park. History Most cities in Britain tend to regard cathedrals as the centre of their cities, whereas Brighton does the opposite. Royal Pavilion, the landmark of the southern coastal city of England, was built in 1815 to facilitate the meeting between Prince Reagan and his mistress Fitzherbert. The Royal Pavilion, Brighton was designated by the Royal Empire as a summer resort in the 19th century. Royal and upper-class men and women rushed to the Sunshine Coast for their holidays.